The NX720S 15" NX Series Powered Subwoofer from Yorkville Sound uses a single long-excursion, neodymium-magnet 15" woofer to deliver maximum output over the entire 40 to 150 Hz range. The NX720S has sophisticated processing circuitry that protects the driver while maximizing the use of the available power. The fast limiter protects against clipping and over excursion. It is located with both high and low pass filters on either side of the limiter to guarantee that only the correct frequency content reaches the driver. The slow (RMS) limiter is equalized to adjust for the impedance variations of the loudspeaker system over frequency. The carefully tailored attack and release times ensure that maximum level is available from the system. The input section in the NX720S allows for a variety of system configurations. There are two input sections allowing two signals to be blended into the NX720S. This allows stereo left and right signals to be summed into one NX720S while preserving channel separation of the stereo signals. Each input section has XLR male and female jacks to allow loop thru of line level signals. In addition one input section also has two 1/4" jacks that may be used for loop thru of line or speaker level signals. Within each section all jacks are connected in parallel. Simple controls on the NX720S include an input gain control (Volume), variable high frequency cut-off and low-frequency tunable bass boost. 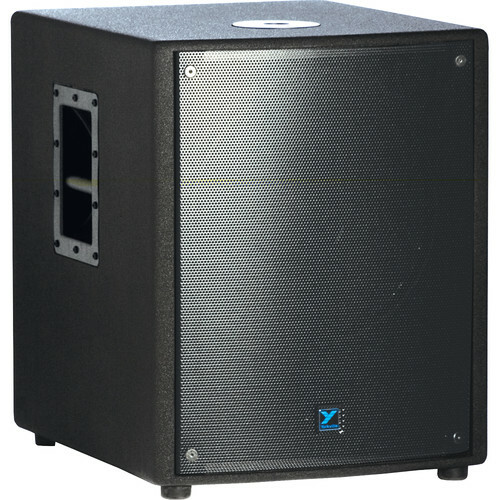 The variable high frequency cutoff is adjustable from 90 to 150 Hz to trim the subwoofers low-pass filter to suit whatever full range cabinets are being used with it. A low-frequency tunable bass boost adjustable from 45 to 90 Hz has been included to allow subtle customizing of the bass character. Proven Class D amplifier technology allows the NX720S to operate without a fan while preserving ample thermal margin without the need for large heavy heat sinks so it is lighter than conventional amplifiers. Solid, rugged 5/8" 11-ply Russian birch cabinet construction provides reliability. A heavy gauge perforated metal grille protects the speaker. The unit is equipped with integrated metal bar handles and a metal speaker-stand pole-mount. Box Dimensions (LxWxH) 23.25 x 22.0 x 19.0"